It looks like the Saudis and the UAE, backed by naval bombardment, is finally getting down to business in Yemen. 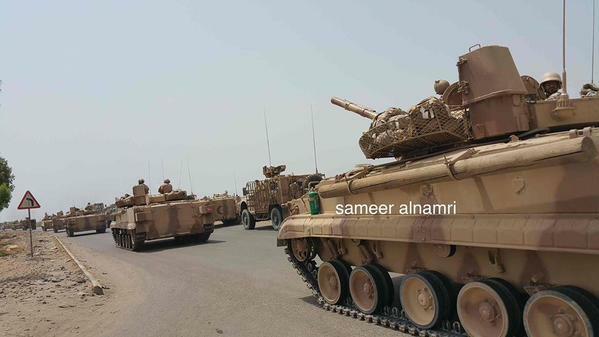 It is not going to be pretty because the Saudis are apparently willing to scratch the paint on their tank fleet. With 1200 tanks that is a serious force even if only a fraction is deployed. What this means for the Iranian-backed Yemeni rebels is annihilation. And there is little chance Iran is going to be able to do much to stop them as it is occupied to the north trying to keep Assad in power and fighting ISIS. In broader terms this is a departure for the Saudis who have usually kept ground troops at home. It is also a setback for Obama’s whistling past the graveyard Middle Eastern surrender. His boys the Iranians are going to suffer a significant loss to their Sunni enemies. My bet is that the Saudis didn’t bother to ask permission or even tell the Americans they were going to launch this offensive. The ever dumb Kerry was in Qatar as the offensive launched meeting with Sunni leaders. Want to bet they mentioned the fact they were taking on Iranian proxies. And if the Sunnis did not bring in the US where were they getting their satellite intelligence from. One guess. Those fiends in Israel have 24/7 high-res coverage of the relevant areas. Things are changing fast in the Middle East. The Big Zero has been benched.